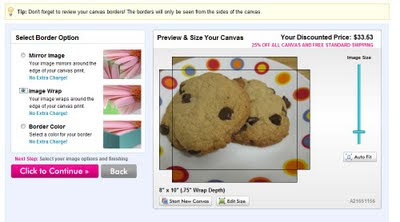 Recently, I was offered the opportunity to review a free canvas print from easy canvas prints. I've been intrigued by canvas prints and had been considering ordering one made from our wedding pictures, but then, you know, moving across the country and new jobs and all that. So I jumped at the chance! This is not really the photo I ordered. I ordered an 8x10 of my favorite of our wedding photos that, if I'd had to pay for it, would have cost about $35. What I received (within five days!) is definitely worth $35. The canvas feels strong and sturdy, it's tightly bound to the frame, and already has a bracket for mounting. And honestly - it's gorgeous. I have this photo printed on photo paper as well as our holiday cards, but I think the canvas effect is by far my favorite. Modified to protect our privacy. If you've been considering getting a canvas print, I have to recommend Easy Canvas Prints. Full disclosure: I received a free 8x10 print in order to do this review, a value of about $35 at the time of this post. My opinions are genuine, however - I'm very pleased with the quality and speed of service. I will be using this company in the future, and paying full price. Update on 6/25: If you like Easy Canvas Prints on Facebook, you can get 50% off plus free shipping on your first order - limited time only, but a great way to try out their prints. Thanks for posting that! A certain other big-name blogger (PW) posted about some canvas prints, and it didn't occur to me to look for comparison shopping options. I'm planning to do some of this later this year, so I'll bookmark their site. Their marketing may pay off!